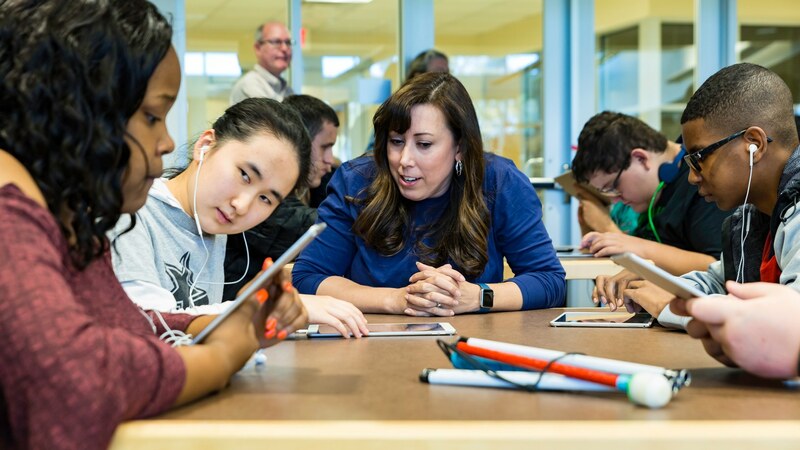 In addition to existing iOS accessibility features, Apple is augmenting the Everyone Can Code curricula with tools and resources targeted at students with visual and hearing impairments. Earlier this week, Apple engineers visited the Texas School for the Blind and Visually Impaired where they led a programming course from the company’s Everyone Can Code curriculum. According to the Austin Statesman’s technology blog, Open Source, the class was the first such session led by Apple for blind and low-vision students. Swift Playgrounds and Apple’s Everyone Can Code curriculum have grown at a remarkable rate and are fantastic resources for students, teachers, and parents. However, it’s Apple’s long-standing commitment to accessibility across all of its products that helps ensure that those resources are available to as many students as possible. You’ll automatically see new and updated playgrounds in your subscriptions, a content gallery that shows all playgrounds in a single view, new robots, and much more. Subscriptions can be added by entering a URL or by browsing a gallery Apple has created, both of which are accessible from an ‘Add Subscription’ button in the top right-hand corner of the screen from which you add new playgrounds. As of publication, the buttons for adding subscriptions from the gallery do not work, but they should soon. When updated playgrounds are available, you can receive a notification too. 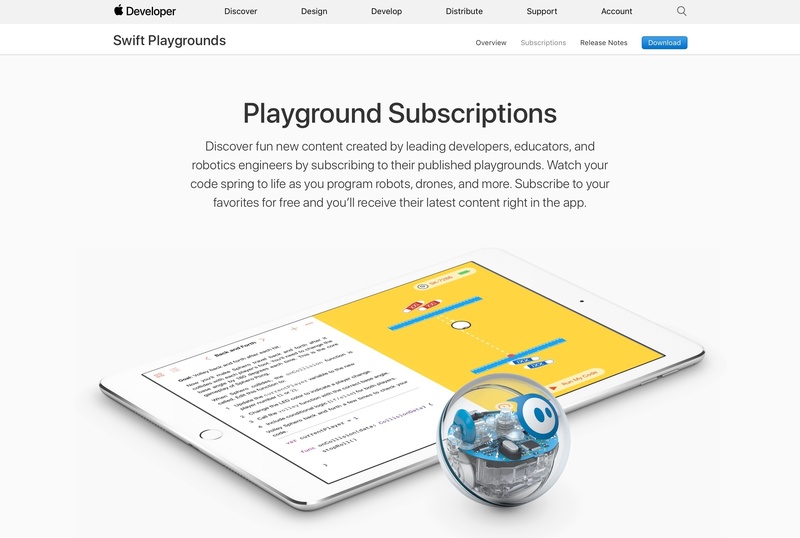 Among the first third parties with subscription-based playgrounds are Sphero, Lego Mindstorms, UBTech, Parrot Drones, IBM, Mekamon, Wonder Workshop, and Skoog. In addition to subscriptions, the update includes enhanced documentation for the Swift programming language and iOS SDK, and playgrounds can be opened from the Locations button in the Files app. 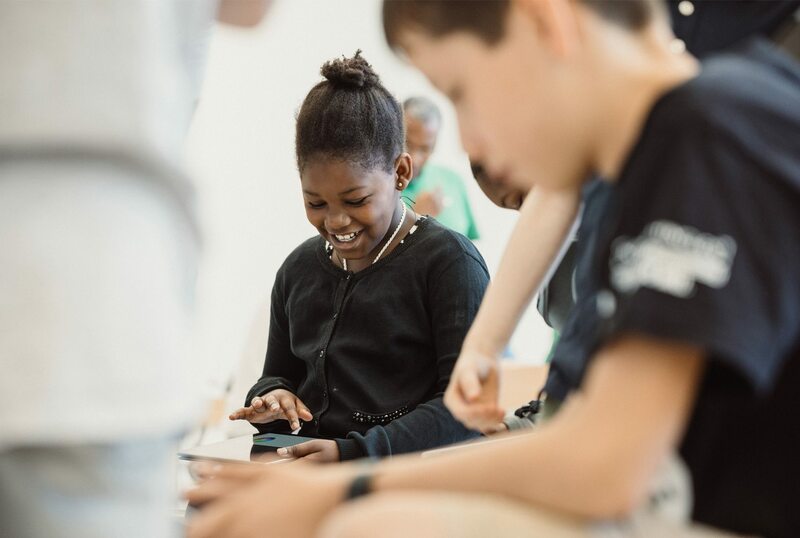 Young aspiring coders can learn coding basics during a Kids Hour session, while those age twelve and above can use Swift Playgrounds on iPad to learn coding concepts and even program robots. In addition to the in-store lessons, Apple has added a new coding challenge to its Swift Playgrounds iPad app with which students build and customize a digital robot and new teacher resources as part of its Everyone Can Code curriculum. You can sign up for the Hour of Code sessions here, but act quickly because in years past, these sessions have filled up fast. Apple announced in a press release today that its Swift Playgrounds app for iPad would soon be able to connect with and control real-world devices. 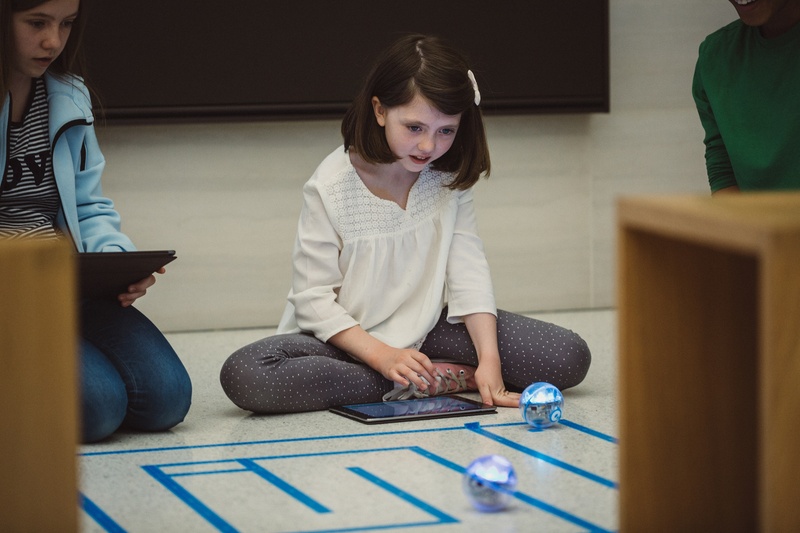 Apple is working with leading device makers to make it easy to connect to Bluetooth-enabled robots within the Swift Playgrounds app, allowing kids to program and control popular devices, including LEGO MINDSTORMS Education EV3, the Sphero SPRK+, Parrot drones and more. The Swift Playgrounds 1.5 update will be available as a free download on the App Store beginning Monday, June 5. 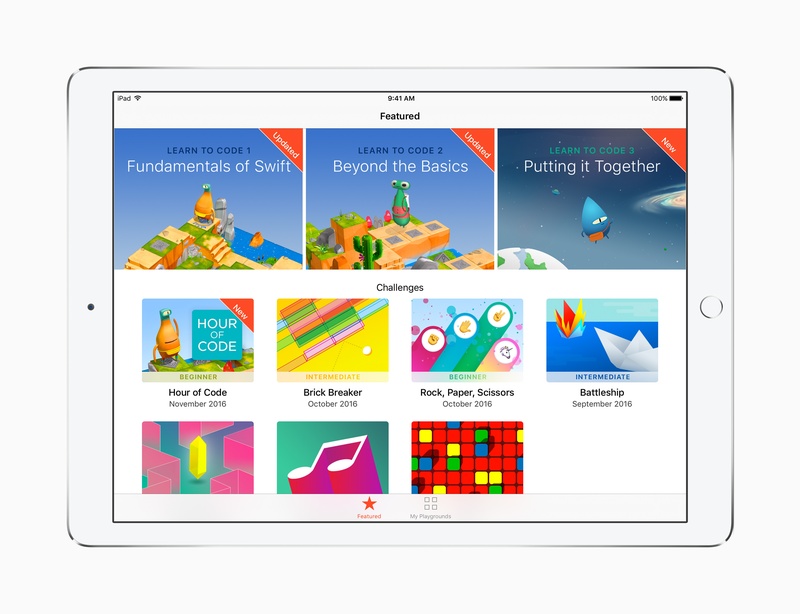 Since the primary purpose of Swift Playgrounds is education, today's announcement serves as a solid next step toward making coding fun and interesting for children. And the timing is fitting too. Expanding the capabilities of Swift Playgrounds with a 1.5 update Monday is a perfect kickoff to Apple's Worldwide Developers Conference, where the app was first introduced last year. Apple introduced a new year-long app development curriculum today for community college and high school students that is available as a special collection on the iBooks Store. The free-to-download course, which is an extension of Apple’s existing Everyone Can Code curriculum for kids in grades K-12, teaches students how to build fully-functional apps using the Swift programming language. In the fall, six community college systems that serve over 500,000 students will offer the new course. Swift Playgrounds has proven to be a powerful teaching tool with over 1 million downloads since it was introduced. In addition, over 1,000 schools in the US plan to teach using Apple’s Everyone Can Code materials in the fall. The extension of Everyone Can Code to older students should make the entire program even more attractive to educators than before. 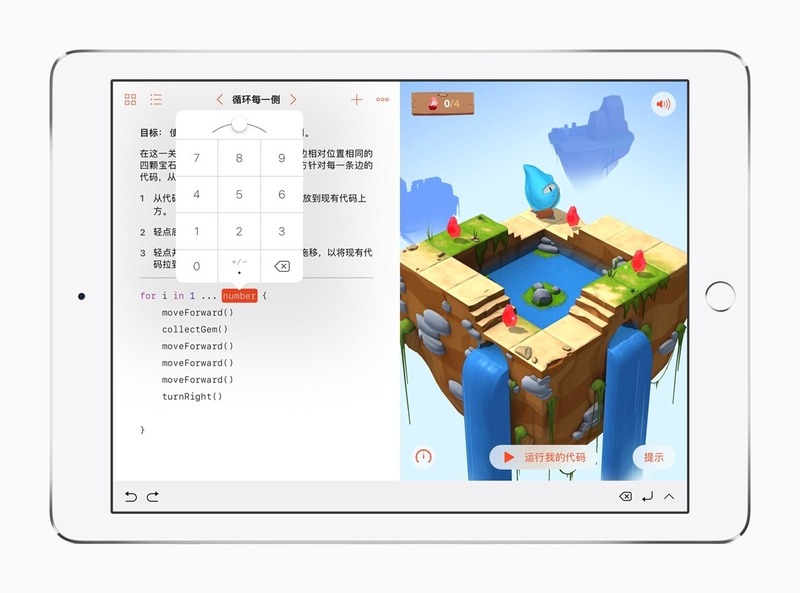 Today Apple added support for five new languages to its Swift Playgrounds app for iPad: Simplified Chinese, Japanese, French, German and Latin American Spanish. Swift Playgrounds is available on the App Store. Chris Lattner designed and built most of LLVM as a graduate student. In 2005, he joined Apple where LLVM was integrated into Apple’s developer tools. Beginning in 2010, Lattner designed and built much of Swift, which was introduced to the world by Apple at WWDC in 2014. Since Apple launched Swift at WWDC 2014, the Swift team has worked closely with our developer community. When we made Swift open source and launched Swift.org we put a lot of effort into defining a strong community structure. This structure has enabled Apple and the amazingly vibrant Swift community to work together to evolve Swift into a powerful, mature language powering software used by hundreds of millions of people. I’m happy to announce that Ted Kremenek will be taking over for me as “Project Lead” for the Swift project, managing the administrative and leadership responsibility for Swift.org. This recognizes the incredible effort he has already been putting into the project, and reflects a decision I’ve made to leave Apple later this month to pursue an opportunity in another space. This decision wasn't made lightly, and I want you all to know that I’m still completely committed to Swift. I plan to remain an active member of the Swift Core Team, as well as a contributor to the swift-evolution mailing list. Working with many phenomenal teams at Apple to launch Swift has been a unique life experience. Apple is a truly amazing place to be able to assemble the skills, imagination, and discipline to pull something like this off. Swift is in great shape today, and Swift 4 will be a really strong release with Ted as the Project Lead. Note that this isn’t a change to the structure - just to who sits in which role - so we don’t expect it to impact day-to-day operations in the Swift Core Team in any significant way. Ted and I wanted to let you know what is happening as a part of our commitment to keeping the structure of Swift.org transparent to our community. 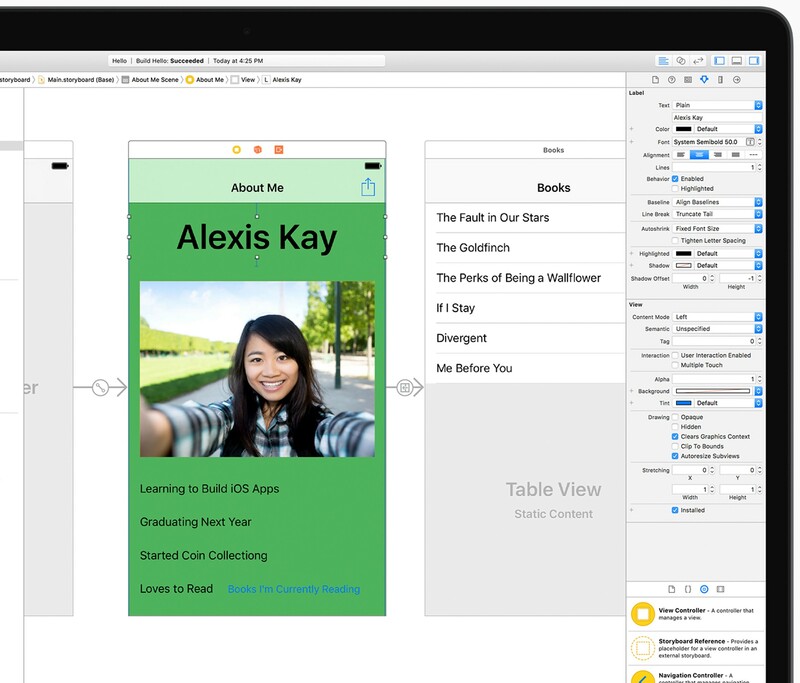 Lattner’s contribution to Apple’s developer tools has been enormous. His departure is a big loss for Apple. Apple has participated in Code.org’s Hour of Code challenge for the past three years. Apple announced today that it will participate again this year with a series of workshops for kids from December 5 - 11, 2016, which coincides with Computer Science Education Week. Hour of Code embodies our vision for Apple stores as a place for the community to gather, learn and be entertained…. We’re proud to introduce the Swift Playgrounds app into the workshops and honored to again work side-by-side with Code.org on this incredibly important initiative. Hour of Code is one of the absolute highlights of the year for both our teams and the families that visit our stores. A new Hour of Code challenge in Swift Playgrounds makes it easy for anyone to set up their own one-hour coding event, and for those continuing to build their coding skills on iPad, Swift Playgrounds adds a new Learn to Code 3 set of lessons and a companion Teacher Guide. Signup for the workshops is not yet live, but should be available here soon.